Despite the hundreds of new fragrances released each year, I seem to spend a lot of time exploring scents first created years ago. I feel like I have so much catching up to do with perfume that I barely have time to see what's happening at my local department store. Here is a belated review of a relatively new department store perfume, probably old news to many of you: Lanvin Rumeur. Perfumer Francis Kurkdjian developed Rumeur, and it was released by Lanvin in 2006. Rumeur steals its name but not its olfactory inspiration from the original Lanvin Rumeur first released in 1934. The new Rumeur's notes include magnolia, white roses, jasmine sambac, seringa, orange blossom, lily of the valley, patchouli, musks, and ambroxan. 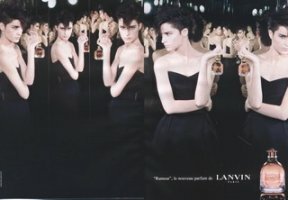 A Women's Wear Daily article quotes a Lanvin representative saying, "It's not a young scent; it's for women from 30 years old to 80" (8/25/2006). Rumeur opens with a sparkling floral burst that hints at a happy, gardenia-like scent. This fresh beginning quickly flattens into a dull, dry, vaguely rose, jasmine, and lily of the valley heart that feels fuzzy and high-pitched to me. Imagine standing in a stuffy storage room and looking at a dusty, plastic bouquet on a shelf a little too high to reach. You stand on your tiptoes and grab at the bouquet, but after a few minutes of fruitless struggle you give up and decide to open a window for fresh air to ward off a migraine. That's how the middle of Rumeur feels to me. And Rumeur goes on and on — through twelve hours, washing a sink full of dishes by hand, and a bath. I tried Rumeur three times, and each time I worked to give it a fair shake. Once, to counteract my perfume snobbery, I imagined that I was sampling a rare scent from the Osmothèque. The problem was that I kept getting the image of a bitter lemon and rose chiffon pie in my head, only the chiffon was made of recycled plastic soda bottles. Another time I wore Yves Saint Laurent Y on one hand, so that I could compare them (I had decided, without any proof at all, that Rumeur might be an example of one of the new, oakmoss-free chypres, and I wanted to smell it next to a real chypre), but I found myself huffing the Y hand for relief. Of Lanvin's perfumes, Arpège feels like a diaphanous afternoon dress, My Sin a black, décolleté evening gown, and Scandal a pair of leather thigh boots laced up the back of the leg. Rumeur joins the lineup as a thin, pink acrylic nightie that unravels in the wash. However, I know lots of people like Rumeur, so don't let my review dissuade you from trying it if its notes sound interesting to you. Lanvin Rumeur is available in 15 ml Parfum; 30, 50 or 100 ml Eau de Parfum. You can find the (adorable) 100 ml Eau de Parfum bottle for less than $30 at several online discounters. What I like about Rumeur is its 2 day old scent on my jackets; it is then that I can get past the high pitched notes (yes, I agree with that!) and it is much softer and accessible. It's really hard to like Rumeur otherwise. My nose keeps rejecting it. Definitely works as a closet spray, though. And I love the bottle. Rumeur has it LOL! I am sitting here writing this review with a full bottle of Rumeur beside me. I purchased this fragrance from Saks Fifth ave in New York. I have been buying fragrances for years from a very nice lady by the name of Claudine. Well anyway she thought I might like Rumeur so I bought it on the blind. I wore the sample once and a lady said to me “Oh my boy you smell so good I could just give you a hug”. I got out of the hug! I don’t get dirty closet from this scent, but nothing really excites me either about this sent. I don’t hate it, but I don’t love either. I guess I am indifferent on this one. And by the way Rumeur has been discontinued. Again this is a mans point of view. Rumeur has been discontinued, huh? That’s good information–thanks! The bottle is great, I agree. But I'm just not wild about the scent (in case you couldn't tell!). I know lots of people like it, though. Ha ha! Angela, this was a great read, and made me laugh. Though I've never tried Rumeur, I now have no desire to! Thanks for the review. I feel kind of bad giving it such a rotten review when I know that people like it. Still…just call me cranky. Or particular. Or not so good with the “floral musky woody” scents. Maybe I won't try it again after all…….. I just pulled out my sample that was waiting in my sample bag and put some on about an hour ago. I definately do not like the way it smells and I think it kind of smells like a dirty closet so I wouldn't even scent my closet with it, maybe the bathroom! You may be right – I use my acres of Kate Spade samples to scent the bathrooms – it's the safest place – I had a Kate Spade 'moment' a few years back and my SA's would give me zillions of those little vials every time I bought the body creme (I travel a lot so the vials were great! )…but now my KS days are over…. …..so my bathroom has a pleasant, floral smell to it, most days. I also use it to freshen the carpet in the guest room upstairs – it dries down to a nice, pleasant floral that keeps the room feeling a bit fresh and in-use, if that makes sense? Hey, maybe you're TOO advanced to appreciate it! Or, maybe the third time will be a charm. I gave it three solid tries, because I know sometimes it takes at least that long for something to register with me. Oh Kate Spade! I kind of miss it. I always want what's been discontinued (at least I'm pretty sure it has been discontinued since ebay's prices are outrageous). if you're serious about that, let me know! Great review, Angela! I'm with you all the way. I wanted to love it — I love the bottle, love the idea of having a modern Lanvin, loved the idea of something neo-classic — but just couldn't love the scent, for all the reasons you couldn't. Funny, cuz I thought I'd probably be the only one who felt that way, while “real” perfumistas *got* Rumeur. I'm kind of happier now!! you know, this blog is why I never get any 'real' work done anymore, LOL! Such fun to chat with you all about such a lovely topic as perfume! Much appreciate your taking the time to write your fabulous reviews. …back to Rumeur: Angela, I suspect it will stay old and musty on me – I usually don't change my mind about scents like that, but we shall see. A dear friend gave me a bottle of Fresh Index Pomegranate Anise and Lord knows I tried to like it – I really did. But every single time I applied it I got a shocking headache! That's where the 'bonehead' comes in:-) You'd think I would've stopped at 3 tries but noooo…. …PAnise is so bad (for me) that I can't even use it to scent the bathroom! Dangit! This scent is such a disappointment and doesn't do the house of Lanvin justice. I'm glad you're happier! It takes courage sometimes to say you don't like something. M, it's rare that a perfume gives me a headache, but it has happened, and when it does it's terrible! It sounds like you're smart to leave it alone. Arpege! Now that's a beauty. It's a full-bodied, floral duvet of a scent, but I love it. I know. I was disappointed, too. I wonder how its sales are? Probably booming–but maybe not. I'm with you– I cannot stand Rumeur. Migraine city. It reminds me of everything I don't like about perfume. It's claustrophobic and took a long time to fade from my skin as well. Arpege, on the other hand, is a big ahhhh. Gorgeous. I haven't tried the Eclat, but I want to. And yes, there's a Rumeur flanker on the way…. We are on the exact same page! well that settles it! I'm going to have to try Arpege again. It's been probably 40 years I tried it (is it that old? I know I am, LOL!). I've heard nice things about the reformulation and since I can't remember the original it will probably make no difference anyway. I haven't ever heard anyone say anything bad about Arpege so I'm looking forward to trying such an icon! It's definitely one to try, although I have to admit that I didn't love it immediately. But, it never gave me a headache, and I sure do love it now! i get a distinct nail polish note every time i sniff the bottle or scent strip. shudder. so i've never plucked up the courage to try it, despite having walked by it numerous times. I definitely get a plasticky-nylony smell. I wonder if it's the same thing? Yep, nail polish exactly! That was my first thought. Sharp and acrid. The flanker is Rumeur 2 Rose – don't know when it's coming to the US. I haven't had the pleasure of trying Arpege, but the Eclat Arpege (sp) is … meh. Arpege is definitely worth a try, even if it isn't as easy to find as Rumeur these days. I promise you: no nail polish there. Okay, first of all please allow me to say that I love love love this blog. I'm a relative newbie to the world of niche/upscale perfume. I have spent my last few paychecks (not really, but it seems like it…) at the Perfumed Court and I feel like I've re-discovered a sense (smell) that I have ignored for far too long. Might be a benefit of having quit smoking six months ago. I have to stick up for the new Rumeur. I even invested in a bottle of this stuff. My tastes are generally much darker/funkier, but I found that Rumeur filled an empty slot in my newly expanding fragrance wardrobe. It is a dusky pink flower that reminds me of my grandmother in a good way. There are some days when I just want to smell “pretty,” and this does it for me. Maybe after a few more years of collecting I'll see it otherwise, or maybe it just works for me. While I like Rumeur, it is very short-lived on my skin. Is there a rule that the more you like a scent the sooner it disappears? What's up with that? LOL – I have some favorites like that. I'm beginning to believe in perfume gremlins. Hurray! I'm so glad to hear from a Rumeur fan, and I'm glad you're not shy about it. I have lots of perfumes that I wear because, as you say, I just want to smell “pretty”, so I know exactly what you mean. I wish I could smell it on your skin–that might make all the difference. What a drag that Rumeur disappears so fast on you! On me it sticks like glue. I smelled it while on a walkthrough at Nordstrom and thought it wasn't me, but decided to try again a week later. It's a lot more not me, between the plastic roses and the artificial armpit musk, my work here is done. Elizabeth, you might try the Vaseline trick (credit to bartamy, I think). I tried it with Bulgari The Vert yesterday and it seemed to work. Obviously you could do the whole layering thing with a Rumeur body lotion, assuming there is such a thing, but in lieu of that, try just dabbing a very light film of Vas (or equivalent) on your wrist before application. I think it probably increased The Vert's wear by 30-40%! Mamabear girl, 48 hours is a loong time to wear a scent..!!! Well, Fracas is a bit of a powerhouse – you sort of have to commit to it. It's got some serious smackdown tendencies. I once made the mistake of wearing Fracas in August (in NYC). It's enough to bring up your lunch then but perfect for these chilly days. But it does last a long time. And once it's on your clothes it's on to stay for quite awhile! Never tried Fracas. Don't know if it is available here. You know if a good fragrance stays on clothes for days, that is quite nice but on skin that is too long for my taste. I will look Fracas up on the internet. Am curious now. Is that the company's name or the name of the fragrance? I don't know if NST has ever reviewed it. I've been wearing it for the past 25 years so it's a huge part of my fragrance wardrobe. It is a big bomb of a fragrance. Robin, was it you who said sometimes it feels as if the fragrance wears the woman, rather than the other way around? If so, I agree completely. It's not for the faint of heart. As I said, you have to commit to Fracas (at least I do) because once it's on – it's ON, in more ways than one. You can wash it off – but it sill lingers a bit (at least on me). Maybe because my chemistry loves it so? I always think of Fracas as a big, womanly fragrance. Dame Beverly Sills wore Fracas, if that's any indication! In my perfect world the Fracas wearer would be in a hat and gloves a la Dior's New Look. But that's just my opinion. You can get it in Paris (I try to pick it up there, when I can – it's fresher) but I suspect it's available all over the place. I have Rumeur lotion – forgot to mention it. I like it a lot more than the actual perfume; has less of the sting and is quite wearable. It's interesting how sometimes the lotion can be different than the bottled scent. Thanks for letting us know. I love Fracas, but I had to work my way up to it. I find when I apply it from the little rollerball applicator, it's milder – gets to the creamy drydown faster. Otherwise, it's pretty wild for a couple of hours! But well worth trying. Thank you Mamabear for the website! Read the description of Fracas and I thought “must try this one!”. It's a pretty commonly-sold fragrance, usually in higher-end dept stores. What is your equivalent of Saks Fith Avenue there? Try them – I'll bet they have it! Overhere Marionnaud and Douglas are the better stores. Well Sephora is also pretty good. Yes indeed why not just go and ask for the Piguet fragrances. Fracas is from 1948, right after the World War II so no wonder that it is an explosion (or a bomb) of delight. Back then people wanted everything in life to be better and in abundance again. Would be interesting to smell a perfume from that time. How did you come to love Fracas? I mean it is not the most obvious choice. Now I'm old enough to pull it off better, though my daily life and fashion doesn't really suit Fracas these days. Can't wear Dior New Look to a foundry! I just heard from the Piguet folks – there is a new fragrance out called Visa – not crazy about the name (credit card associations abound) but I am anxious to try the fragrance. When you go to Marionnaud, see if they have it and let me know what you think. It's only at Bergdorf here and I won't be in NY anytime soon. M. I am also in my mid-50s and I don't feel old !! In fact I feel so much better than when I was younger. Sounds like you had a really interesting life when still so young. And you were already so into perfumes! incredible. For sure you know what you like. I will go after the Piguet perfumes. Who knows maybe they have been right under my nose? Visa… my association is: permit to enter and to stay. What Fracas has been to you Boucheron and Byzance have been to me. I didn't know they had a rollerball application. That might work better for those times when the parfum is just too overwhelming. I love, love Fracas. Really anything by Piquet is great. This is the only time my husband says he likes a fragrance on me. I do not get the big flower scent that everyone associates with it. With Fracas I think it just melts into my skin and I can't really seem to smell it on myself. I'm so sorry! We really did hijack this thread, didn't we? Not intentional..in fact, I don't even know how we got off on the whole Fracas-thing! My apologies (I think this is my fault). Well, okay! Back to our regularly scheduled programming! I am sorry too Angela. Just got carried away with Mamabear to another perfume era. Mamabear and Marianne: No problem at all! I love to see people getting carried away by perfume. I just didn't want you to think I was ignoring you, that's all. Feel free to post anything you want about perfume. I envy you! I have to be very judicious in my use of Fracas – those flowers LOVE me! And if used with abandon, Fracas can clear a room (my opinion). It is gorgeous, though. Totally unapologetic about what it is. I will always have that perfume in my collection. Am anxiously awaiting a sample of Visa – have you smelled it? Rumeur – I love it. I had worn L’Interdit and Arpege only since 1978 and was devastated when the original L’Interdit was changed to something awful! Rumeur, for me, is a wonderful replacement for L’Interdit. It doesn’t scream out loud like so many of the newer perfumes. And, on my skin, it smells simply wonderful! I think everyone’s skin changes the scent of a perfume to its personal own. It’s very French! It’s soft and interesting on my skin! I’m glad it works so well for you! And a good replacement for L’Interdit must be wonderful. You’re so right about how perfume can be different on everyone’s skin. Rumeur is the scent that taught me that there’s a particular woody-musky drydown that is popular right now that sits like bugspray on my skin, unfortunately. I tried Rumeur when a friend let try her sample; I hated it!! Fast forward to a year later when I ran across the sample in my dresser drawer and loved it!! I bought a very large bottle, used it and I hated it again. This is one of those fragrances that you have to delicately spray, otherwise you just wish that you had a stuffy nose. The last time I used it was during the dog-days of summer and maybe it was just too hot that day but I just knew I was going to throw up. We’ll see if I fall in love again during the colder months. Funny! Maybe I need to try it again. It sounds like kind of a finicky fragrance.